Lately there has been some confusion on the different FreePBX Distro versions. I am going to take a moment here and try and explain how this all works. 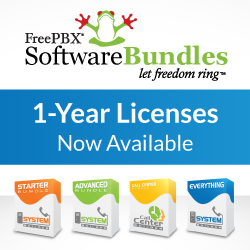 The FreePBX Distro is a CentOS Distribution that includes a specific version of CentOS, Asterisk and FreePBX. Until this week we offered the following 3 tracks. Think of each track as their own release cycle. Within each track we offer [url=http://www.freepbx.org/forums/freepbx-distro/distro-discussion-help]Upgrade Scripts[/url] that generally upgrade published CentOS packages, asterisk, DAHDi and FreePBX. Generally you can not upgrade between tracks but we do make exceptions if the track is on the same main CentOS release such as CentOS 6.x or 5.x and we have set a track to be End of Life. We specifically don’t offer upgrade scripts to go from a CentOS 5.x to 6.x released distro such as 1.10xx.210.58 to 1.10xx.210.62 since CentOS has not provided any such upgrade and states the only way to upgrade to CentOS 6 from 5 is to do a new install. As we watch the 1.11xx.210.63 track stabilize we will be dropping the 1.10xx.210.62 track but will provide an upgrade path from 1.10xx.210.62 track to 1.11xx.210.63 track since they are in the same CentOS 6.x family. With Asterisk 10 not being a Long Term Release (LTE) from Digium we have no plans on supporting it very long and moving everyone to the Asterisk 11 track since this is their LTE. 1.8xx.210.58 – STABLE – END OF LIFE. Receiving upgrade scripts for new Asterisk 1.8 and DAHDi versions only. Will not be building any new ISOs for this version. Recommend using FreePBX backup and restore to move to a Newer Centos 6.x track of the ISO long term. 1.10xx.210.58 – STABLE – END OF LIFE. Will not be receiving any Upgrade scripts and recommend using FreePBX backup and restore to move to a newer supported version track.